It's truffle time. You ready? What a funny question. Of course you're ready. 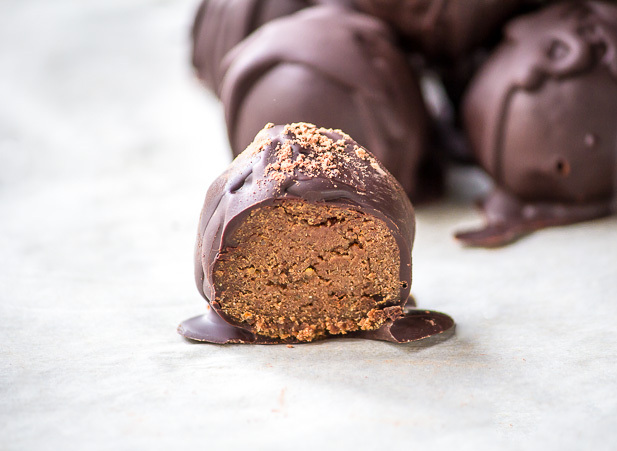 Today we're talking about these peanut butter chocolate protein truffles you see below. It's been a while since I've posted so let's get right to it. 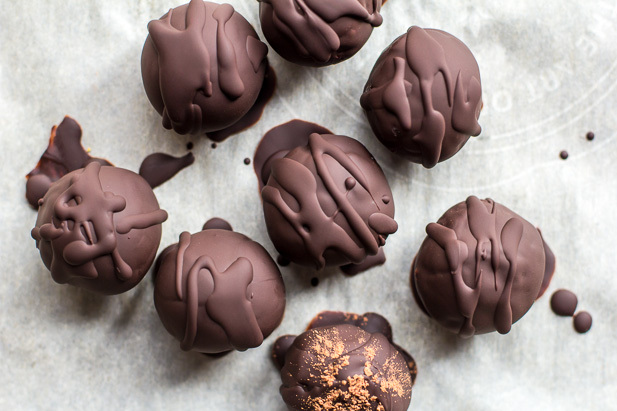 I'm a fan of bite sized everything - from maple pecan protein bars and raw cacao vanilla energy bites, to no-bake pumpkin pie tarts and these truffles. The fun thing about these is that they can go straight from the jar and into your lunch box - or your into mouth. Plus they make a pretty little addition to a Christmas goodie tray for any get-together. This is a fairly simple recipe. You'll be able to tell by the consistency of the dough whether or not you need to add more wet or dry ingredients. When adding the almond milk make sure you start with 2 or 3 tablespoons and then mix, you may not need the fourth tablespoon. The dough will be soft and pliable. If you don't have PB2, you could substitute peanut flour, but I highly reccommend trying PB2, as it's nice and low in fat and gives the truffles a great taste and texture. 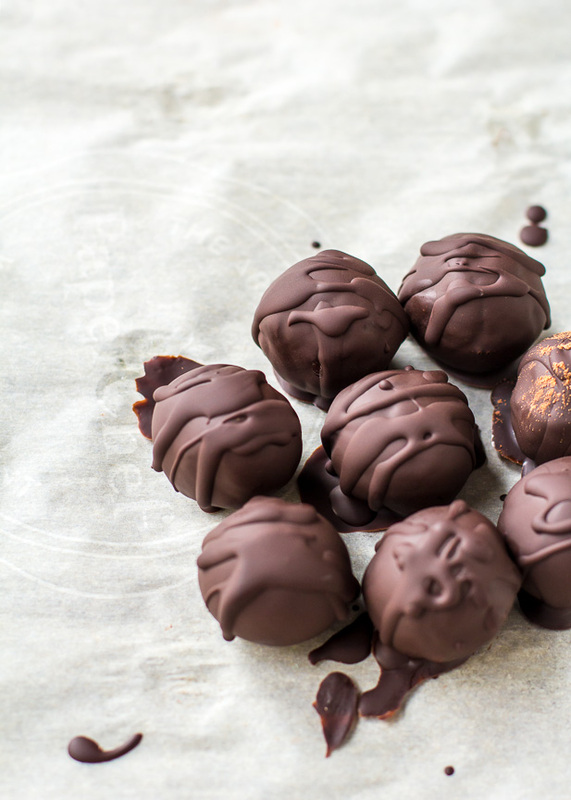 These truffles won't make you feel sluggish or give you a sugar crash. No one enjoys feeling like a big bloated mess. Thanks to some wholesome ingredients, these will help you feel light and energized. I used a base of North Coast Naturals chocolate vege pro 7 protein powder and powdered peanut butter (PB2). Powdered peanut butter is low in calories and fat. It's natural peanut butter without the added hydrogenated oil. And these only have 4 grams of sugar per truffle. No sugar crash here! Now watch them disappear almost as quickly as they were made. 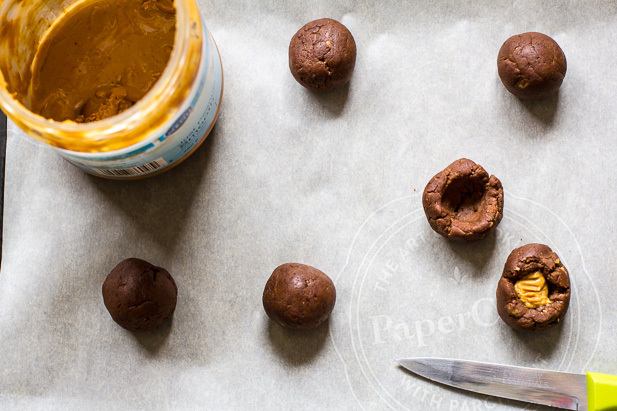 In a medium sized bowl, mix truffle ingredients together until they form a dough. You can do this either in a food processor or by hand. Divide dough evenly into 8 pieces and roll into balls; about 1 teaspoon per ball. Place the balls on the prepared baking sheet. One at a time, push your thumb into the middle of each ball, or use a knife, to pry a hole for the filling. Fill the centre of each with peanut butter, pinch closed and roll back into a ball. Melt the chocolate. 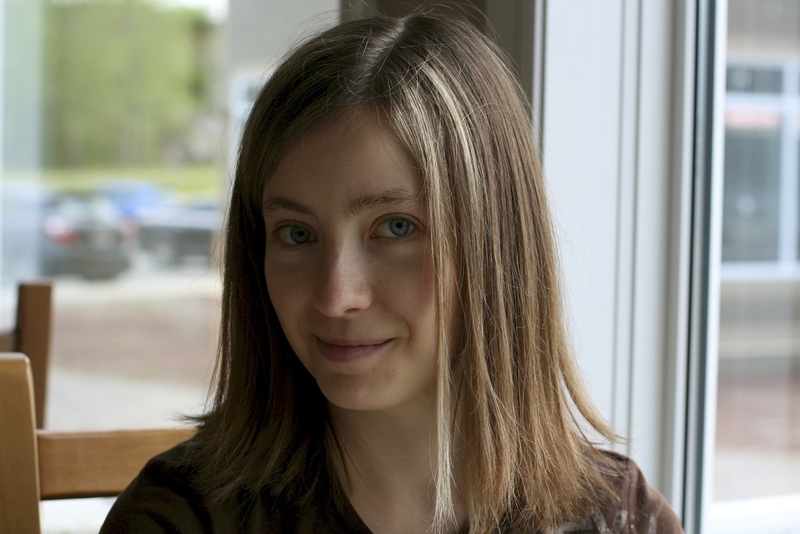 You can melt the chocolate in a double boiler or the microwave. If using the microwave: place the chocolate in a medium heat-proof bowl. I like to use a liquid measuring cup. Melt in 30 second increments in the microwave, stirring after each increment until completely melted and smooth. Let the warm chocolate sit for 5 minutes to cool slightly before dipping. Dip each truffle in the chocolate and place back onto the baking sheet. 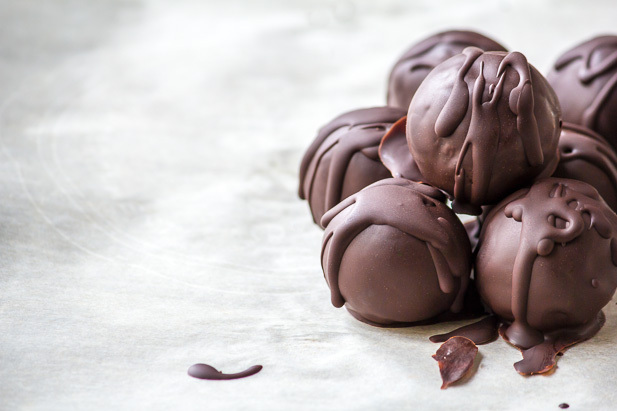 Top truffles with a peanut, a sprinkle of course sea salt, or a pinch of cocoa powder, if desired. 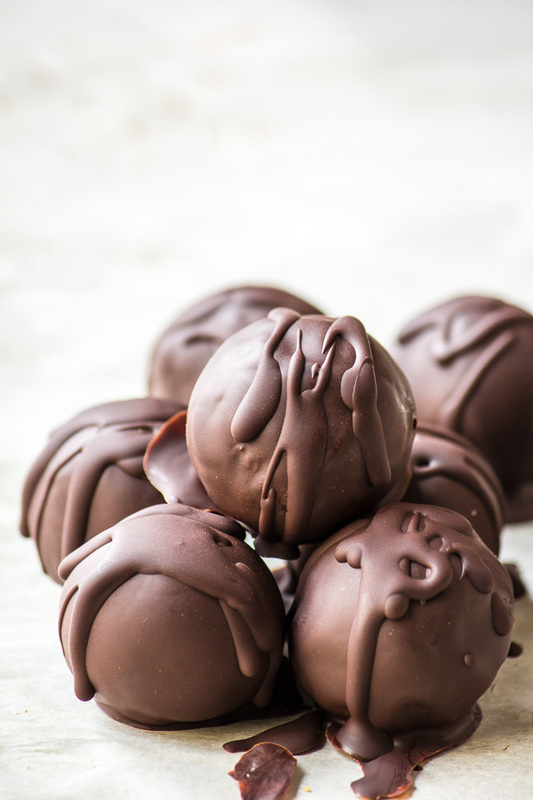 Allow chocolate to completely set in the refrigerator before serving; about 30 minutes. per truffle: 90cals, 7g carbs, 5g protein and 5g fat.